Get your free products with Sale-a-bration – it starts today! 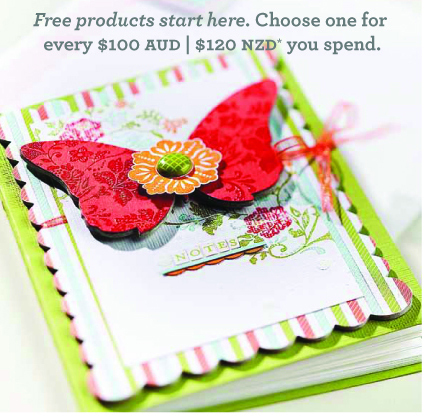 If you love Stampin’ Up!, then this has got to be your favourite time of year – between the 24th of January and the 31st of March, you can earn free products simply by placing an order worth $100 or more! Yep – it’s Sale-a-bration time! This year SU have increased their free products offering, which is great news, because you can now either choose one of four absolutley gorgeous stamp sets, OR you can choose the delightful Everyday Enchantment DSP paper pack (12 x 12inch sheets! ), OR even a Ribbon and Brad Pack to match. Yes that is 6 different free product bundles you can choose from with every $100 order. I can’t wait to share some of the projects I have created with the Everyday Enchantment DSP and Brads with the gorgeous organza ribbon – but as everything I have made to date is for friends who’s birthdays are coming up – you will just have to wait! Until then here are a few samples from Stampin’ Up!